Adobe Flash is one of the most exploited software components of the last decade. Its complexity and ubiquity make it an obvious target for attackers. Public sources list more than one thousand CVEs being assigned to the Flash Player alone since 2005. Almost nine hundred of these vulnerabilities have aCommon Vulnerability Scoring System(CVSS) score of nine or higher. 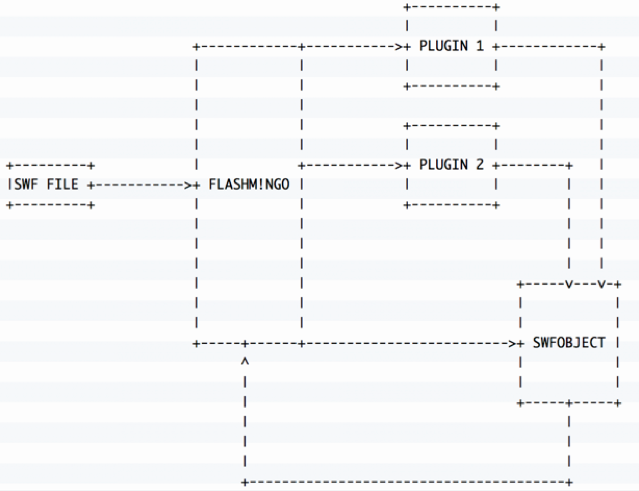 Before we dive into the inner workings of FLASHMINGO, lets learn about the Flash architecture. Flashs SWF files are composed of chunks, called tags, implementing a specific functionality. Tags are completely independent from each other, allowing for compatibility with older versions of Flash. If a tag is not supported, the software simply ignores it. The main source of security issues revolves around SWFs scripting language: ActionScript3 (AS3). This scripting language is compiled into bytecode and placed within a Do ActionScript ByteCode (DoABC) tag. If a SWF file contains a DoABC tag, the bytecode is extracted and executed by a proprietary stack-based virtual machine (VM), known as AVM2 in the case of AS3, shipped within Adobes Flash player. The design of the AVM2 was based on the Java VM and was similarly plagued by memory corruption and logical issues that allowed malicious AS3 bytecode to execute native code in the context of the Flash player. In the few cases where the root cause of past vulnerabilities was not in the AVM2, ActionScript code was still necessary to put the system in a state suitable for reliable exploitation. For example, by grooming the heap before triggering a memory corruption. For these reasons, FLASHMINGO focuses on the analysis of AS3 bytecode. Find suspicious method names. Many samples contain method names used during development, like run_shell or find_virtualprotect. This plug-in flags samples with methods containing suspicious substrings. This is a simple but useful plugin and illustrates how to interact with FLASHMINGO. The plug-in has a logging facility accessible through the property ml (line 2). By default it logs to FLASHMINGOs main logger. If unspecified, it falls back to a log file within the plug-ins directory. 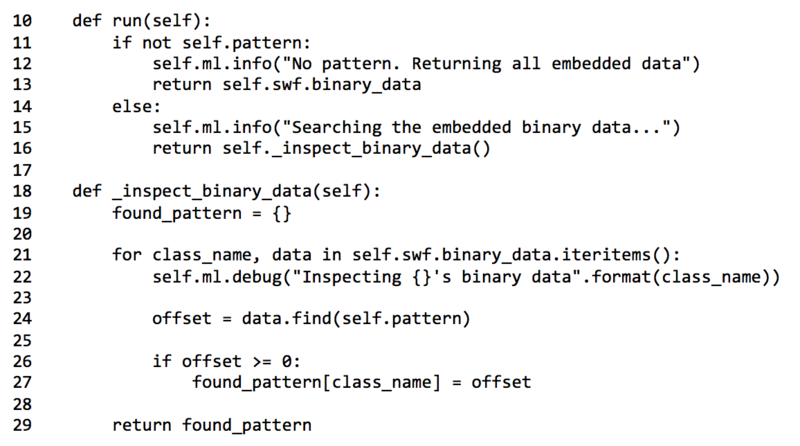 Line 10 to line 16 show the custom run method, extracting information from the SWFs embedded data with the help of the custom _inspect_binary_data method. Note the source of this binary data: it is being read from a property named swf. This is the SWFObject passed to the plug-in as an argument, as mentioned previously. More complex analysis can be performed on the SWF file contents interacting with this swf object. Our repository contains documentation for all available methods of a SWFObject. Even though Flash is set to reach its end of life at the end of 2020 and most of the development community has moved away from it a long time ago, we predict that well see Flash being used as an infection vector for a while. Legacy technologies are juicy targets for attackers due to the lack of security updates. FLASHMINGO provides malware analysts a flexible framework to quickly deal with these pesky Flash samples without getting bogged down in the intricacies of the execution environment and file format.